Implementing the California Common Core State Standards for Mathematics requires collaboration to strengthen teaching and learning. 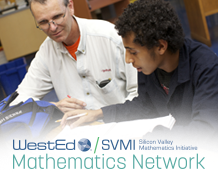 WestEd and the Silicon Valley Math Initiative (SVMI) have partnered to help school districts in Southern California (Los Angeles, Orange, Riverside, and San Bernardino Counties) successfully implement these standards and prepare for Smarter Balanced assessments. The Mathematics Leadership Network engages mathematics leadership teams, including school and district administrators, in professional development to improve their coaching/leadership practice; share ideas around mathematics content, teaching strategies, and learning theory; and network with coaches/leaders from across the WestEd/SVMI Mathematics Network. Members use these resources formatively throughout the year, as a part of regular classroom instruction. In addition, the annual Mathematics Assessment Collaborative assessment, held each spring, provides a summative assessment opportunity for districts, as well as an opportunity for teachers to learn rubric-scoring and to plan instructional next steps based on student performance. This project is funded in part by a grant from the Bill and Melinda Gates Foundation through their College-Ready Education program. 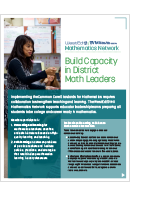 Read about a WestEd initiative created to support educator leadership teams preparing students to be college and career ready in math. 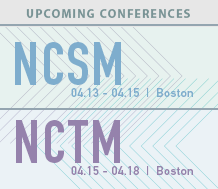 Join us at the National Council of Teachers of Mathematics and the NSCM annual conferences. 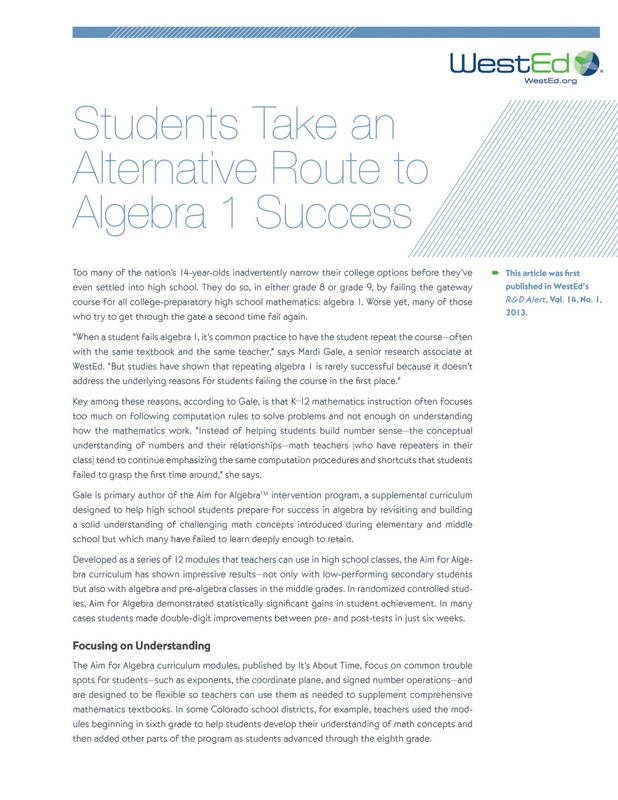 The Aim for Algebra curriculum has shown impressive results—not only with secondary students, but also those in middle school. Get the scoop on this WestEd project. This first-of-its-kind illustrated guide helps both secondary school teachers and students understand geometric transformation, similarity, and congruence.